Dr. Tracy Elliott has more than 20 years of experience working in higher education library services. Prior to joining San José State University as dean of the Dr. Martin Luther King Jr. Library, she was the director of libraries at the State College of Florida. Dr. Elliot has also served as the head librarian at St. Petersburg College, dean of learning resources at Rappahannock Community College in Virginia, patent librarian at the US Patent and Trademark Office in Virginia, and information services librarian at Columbus State University in Georgia. She holds a PhD in Leadership and Education from Barry University in Florida, a Master’s degree in Library and Information Studies, and a Bachelor’s degree in Communication from Florida State University. Please join the co-chairs of the San José State University School of Information’s Leadership and Management Program Advisory Committee, Drs. 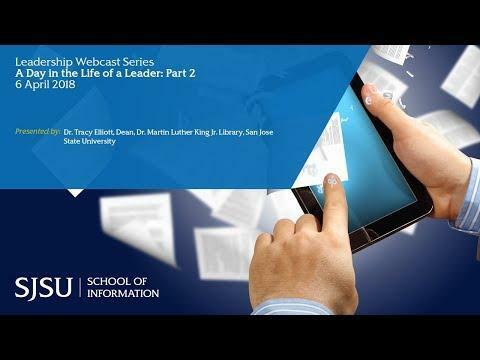 Susan Alman and Cheryl Stenstrom, at 10:00 a.m. PDT for the second in a four-part series on pursuing a career in leadership as an information professional. Each speaker will be sharing their perspective on the most important responsibilities and attitudes for leaders, as well as ways they suggest students can practice leadership skills while they’re still in grad school, or early in their careers. This session will feature Dr. Tracy Elliott, the university library dean at San José State University in California.